Nancy leathem's Trees and Branches: JACK “TIGER” DONNELLY. BOXER Around 1930's to 1940's Ballina, Sydney. JACK “TIGER” DONNELLY. BOXER Around 1930's to 1940's Ballina, Sydney. OK, who is "Tiger" any one know? reports have him from Sydney and Ballina, Known as Jack, he could of been a John or James, he is around the same age as my grandfather, John James (Jack) Donnelly died Sydney buried Casino. 1901-1963. He would be the right age in any case surly a relative? I really cant find any real personal info on him, any one know? Tiger Donnelly Boxing records at BoxRec. Tiger Donnelly at Sport & Note. 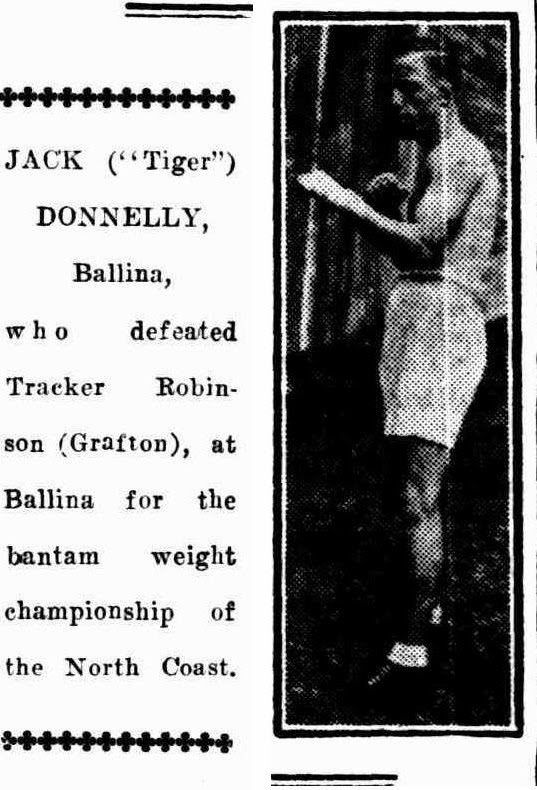 George Baker, one of Brisbane's leading flyweights, meets Tiger Jack Donnelly, of Ballina, in a return contest at the Ballina Stadium next Saturday night for £5 a side, winner takes all. These boys put on one of the most sensational fights yet seen on the North Coast last Saturday, when the decision, a foul in favour of Donnelly, did not meet with the approval of the audience. Although Baker was cautioned on several occasions for low punches, both boys were anxious for the contest to go on. Subsequently they decided to fight a return contest next Saturday, on the conditions stated above. A good supporting programme has been arranged. 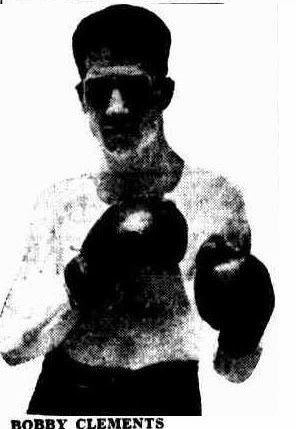 With tragic suddenness, the career of Bobby Clements, flyweight champion of Australia, ended in death from concussion of the brain, soon after he had been knocked unconscious in the eleventh round of his contest with the successful challenger, 'Tiger' Donnelly, at the Brisbane Stadium on Saturday night. As the stricken boxer lay inert after being counted out by Referee Mr. Pat Hill, the cheers for Donnelly were stifled, and the crowd stood silently as the Stadium's medical officer, Dr. J. Barr David, entered the ring and made an examination of the unconscious fighter. For five minutes ice packs were applied to the back of Clements head, but as to the back of Clements head, but he showed no signs of consciousness. He was carried from the ring by his chief second Billy McConnell and placed on a table in the rubbing room. Here the doctor in the presence of three police officers, made another examination, giving as his official opinion that Clements had concussion and a possible fracture of the skull. At 9.50 p.m. Clements, accompanied by McConnell, was rushed to the Brisbane General Hospital, where he was admitted by Dr. J. C. Moffatt. He was breathing, but sinking fast, and death took place 10 minutes after admission. Dr. Moffatt said that nothing could have been done to save Clements. Dr. E. H. Derrick held a post-mortem on the dead boxer, and officially reported that he died from concussion of the brain, out that there was no evidence of a fractured skull. The finishing punches, a left rip to the body, which made Clements sag at the knees, and a lightning left hook to the Jaw, were hard blows From the latter punch Clements fell like a log, his head striking the floor with terrific force, but after five seconds had been counted over him, he moaned weakly, and a slight muscular reaction took place in the right leg He afterwards relapsed into an unconscious state. Sub-Inspector Quinlan stated yesterday that an inquest would be held. Clement's remains were taken to Cannon and Cripp's funeral parlour yesterday afternoon. McConnell, at the request of Clements's mother and three sisters, who reside in Annandale, is returning to Sydney with the body today. Bobby was the sole support of his family, said McConnell. It is terrible to take him back to them dead when only a few weeks ago we left them with Bobby, the champion of Australia in both the flyweight and bantamweight divisions. Clements, who was 22 years of age, started boxing four years ago. He won the flyweight championship from Lindsay, and the bantamweight championship from Miller, besides recording 29 other successes last year. He fought the Queenslander, Maxie Richards, and artistically outpointed him at the Brisbane Stadium on February 15, but was outpointed to lose the Australian bantamweight title to Mickey Miller in the same ring on March 7. Clements remains will be removed to the South Brisbane station at 10.15 a.m. To-day. All the available professional boxers in Brisbane will attend. Mr. Jack Hoult announced last night that he would immediately launch a public appeal on behalf of Bobby's mother and sisters, and would augment the fund by a benefit night at the Brisbane Stadium on a date to be fixed.